Simple question but hard to understand how web browsers make the distinction between legitimate and malicious code when mode=block is enabled? Of course, I would like to know how each rendering engine works. Try changing 12345 to something else and observe how the Auditor now renders the page because the alert()s' values no longer match. // something dangerous with the query string. This also indicates why the XSS Auditor does not prevent stored XSS payloads from executing. First of all, mode=block prevents rendering the entire page when an XSS attempt is detected. This sometimes, but not always, prevents possible filter bypasses over the default mode when the offending code is simply stripped out. 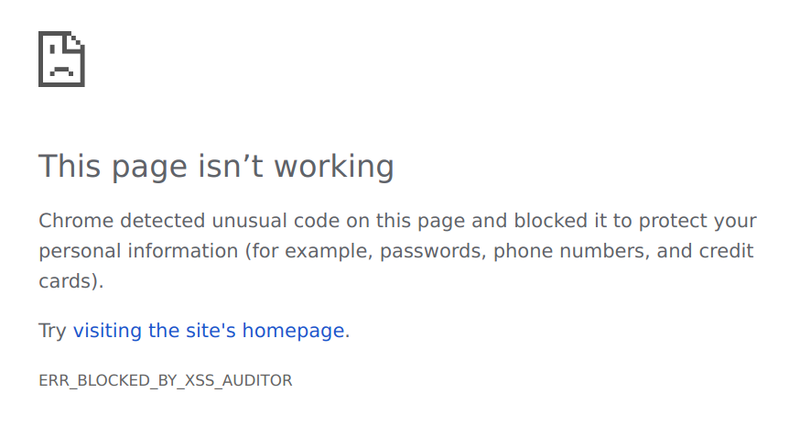 The mechanism behind X-XSS-Protection is called the XSS auditor and is browser specific. As far as I am aware, different browser engines such as WebKit, Chromium, and Firefox all operate differently from each other. Generally speaking though, they operate by pattern matching the requests’ parameters for suspicious values. This, in effect, can only prevent reflection-style XSS attacks. Even still, bypasses are frequently found in all vendors so it’s not a good idea to be reliant on the auditor, but it’s good to have defense in depth. I wouldn’t recommend using only this header nowadays. Only in combination with Content-Security-Policy. Not the answer you're looking for? Browse other questions tagged web-browser xss header or ask your own question. Can web sites detect whether you are using private browsing mode? Why would the BBC web site always ask for a personal certificate, and how do I avoid giving it away? Why is the HTTP Server header not used by most servers, but the User agent used by most browsers?